Club Lotto: the numbers drawn were 17,9,11,8. This is a fantastic way of supporting your club and also win some cash! It’s a brilliant end to a fantastic year for the club. Well done to all the winners. The Larry Walsh competition was played in a great spirit with the Little Bray team winning out. it was followed by an exhibition of silky skills as the over-35s and mentors battled it out to see who would use the defibrillator first. The Christmas Club night kicked off as Liam McGraynor presented Paddy Moynihan with the cup and Gary Prunty belatedly received his 2013 clubman of the year award. 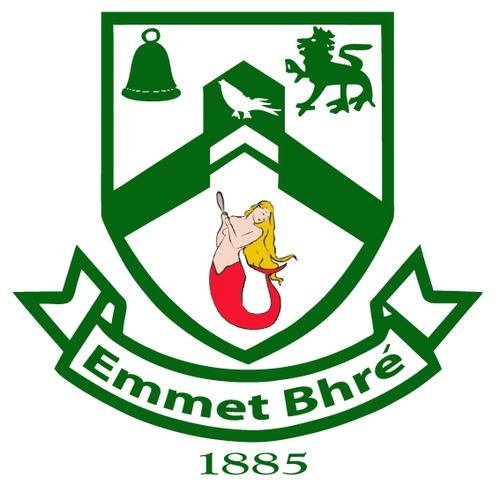 It was a fitting end to a great season for Bray Emmets. Many thanks to all who participated and helped out in what was a very enjoyable day. The national Club draw throws is underway. It’s a fantastic way to raise funds for the club and its teams. The tickets are ideal stocking fillers and are available in the club shop and from committee members. Get your workmates, friends and family in on the act. For €10 you have the chance of winning some fantastic prizes. . Please support this fantastic initiative by, pardon the pun, buying or selling tickets. · 2 Corporate Box concert tickets with pre-concert hospitality in Croke Park in 2014. This year there will be even more. Please support. The Wicklow GAA Year Book is available from the club shop or from club secretary Anne Healy . There is great coverage of Bray Emmets with all our county wins covered. Fergal Devitt, a Bray Emmets man has a documentary on RTE 2 this Wednesday at 9. Fergal is an Irish professional wrestler, better known by the ring name Prince Devitt. He was recently signed to WWE. We wish him all the best.